Topic: The lack of component test standards in the fluid power industry has left maintenance personnel devising their own techniques for testing hydraulic components. This safety topic will explore the pros and cons of the current practice the industry embraces for testing hydraulic cylinders to determine if the piston seal(s) are defective. While the technique is effective at determining the condition of the seal(s), it offers some serious safety implications that you should be aware of. This topic will explore these critical safety issues. Typical accidents associated with "testing" hydraulic cylinders to atmosphere. Safe and effective techniques for testing hydraulic cylinders. A maintenance technician caused an estimated $3.5 million in damages as a result of a fire he caused while he was testing a hydraulic cylinder to atmosphere . . .
A maintenance technician, with no formal training in hydraulics, caused a fiery inferno that razed an entire manufacturing plant. This accident occurred as a result of an accident he caused while testing a hydraulic cylinder to atmosphere. He was not injured. The devastation left approximately 45 persons without employment, and a monetary loss estimated at $3.5 million. The maintenance technician, was reportedly troubleshooting the hydraulic system on a production machine. Through a series of trial-and-error checks, he apparently determined that the problem might be leakage across the piston seals in the cylinder. The cylinder was mounted atop the machine with the oil ports facing up towards the ceiling. There was a gas heater mounted in the rafters above the machine. To determine if the cylinder seals were leaking, he decided to remove the hose connection from the closed-end of the cylinder, and apply full pressure to the cylinder piston, through the rod-end port. He fully retracted the cylinder rod, and removed the hose connection, leaving the cylinder port open to atmosphere. He asked the machine operator to apply full pressure to the rod-end port, while he observed what oil, if any, discharged from the open port. When the operator activated the directional control valve, oil discharged from the open port, and sprayed up into the rafters, and into the gas heater. Within a few seconds, the heater erupted into a fireball. The victim, along with a number of co-workers, attempted to extinguish the flames with portable fire-extinguishers. They called the fire department. Their efforts were futile because of the intensity of the fire, and the distance from the floor to the rafters. By the time the fire department arrived, the entire structure was engulfed in flames. The building and its contents were lost in the fire - the loss was estimated at $3.5 million. The victim was not properly trained to troubleshoot and test hydraulic components. He did not have the proper test equipment for testing hydraulic cylinders. His supervisor failed to determine if he was suitably qualified to troubleshoot and test hydraulic cylinders. This method of testing cylinders was routinely used in his plant. 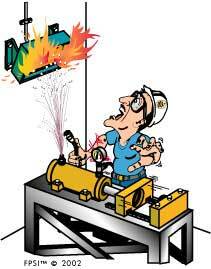 Training should be mandatory for everyone who works on and around hydraulics. This is the only way this, and other accidents can be avoided. Managers and supervisors must not assume that "mechanics" or "technicians" have the "natural ability" to service, repair, and troubleshoot hydraulic systems. Corporate safety personnel should receive, at the very least, hydraulic safety training, so they can recognize potential safety hazards. Hydraulic safety issues must also be addressed in weekly safety meetings. Cylinders are "tested" in factories and plants throughout the world every day using this exact procedure. However, in the majority of cases, the person executing the "test" might get away with nothing more than an "oil bath." Had there not been a gas heater in the rafters, in this case, this would have been an "incident," not an "accident." Anytime oil is discharged to atmosphere, by accident, or on purpose, an accident investigation should be conducted to determine the root-cause of the problem - inexperience, no test equipment, or an authentic accident? Component and machinery manufacturers must provide clear, safety-based, accurate information that is user friendly. The information must apply to their machinery. For example, a manufacturer might use a particular brand of pump in a machine. The information about the pump is usually a photocopy of the pump manufacturer's generic information. However, the pump manufacturer's information might not apply directly apply to a machine. A manufacturer must state very clearly if specialized tools are needed for a particular task, and make those tools available. If specialized skills are needed to do the job, it must also be stated. Component and machinery manufacturers must have properly trained personnel to cater to customers needs. The advice people are given must be safety-based and accurate. There are certain tools that are needed for almost any job. A hydraulics technician should have flowmeters, pressure gauges, temperature gauges, and any other special tools required to service and repair hydraulics. It is not within the scope of this safety topic to provide precise details for testing hydraulic components because techniques for testing hydraulic components are better learned and understood in a hands-on environment - formal training is absolutely necessary. The safe and effective way to test hydraulic cylinders is to use a flowmeter and a pressure gauge. A flowmeter has an indicator that shows if oil is bypassing, and more importantly, it keeps the oil where it belongs - safely within the confines of the transmission lines! Testing any hydraulic component to atmosphere is extremely hazardous - the outcome is totally unpredictable! 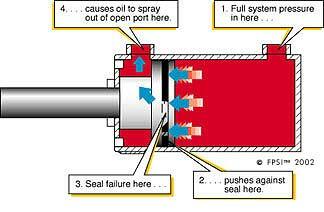 Always error on the side of safety, and keep the oil contained. If you are not properly trained, seek the appropriate training. If you do not have the proper diagnostic equipment, get it. Ironically, this accident could have been prevented with a few hours of training, and a $200.00 (approximately) flowmeter.